Either water DOES have some form of memory OR it DOES NOT. Look at this lovely picture of a crystal of Japanese SPRING water. This spring is situated in a Japanese town well known for its great sake, due in part because of this great spring water used in making this sake. This is the spring of Saijo, Japan. One day we hope to be able to have Heartland Spring water tested at this crystalline level, and be able to place such pictures of the crystals within our Raw Organic Spring Water on this web site. IF water does not have any memory capacity, the status quo thinking among most scientists and the general human mass remains --- with water being treated by many as an object, as a substance for human use (and on-going abuse), but not with any meaningful human interaction with water nor interest in learning much more about water. Alternatively if water does have a memory as Dr Emoto's work suggests then where are we at as a human race in our relationship to water?. Today we are excited and positive about water and its amazing properties. some (if not much or all) of water coming to earth from the outer cosmos --- like an extra -terrestrial visitor or the bringer of life, OR A MESSENGER OF WHO WE CALL GOD. Why do we feel and sense water has a life and a memory? Maybe it is, in part, because we have been drinking the naturally pure and alive Heartland Spring water for much of the past 20 years. It has become a significant part of us, influencing our own thoughts and memory. Maybe it is, in part, because of the experiences we have shared with water ...not just as a substance to drink, but also as a substance to relate to, to communicate with, to share joys and sorrows with, to pray around, to dance and splash and swim in and have fun with ...as we make our own journey toward the eternal being we somewhere inside of our self fell or realise is a possibility. Maybe it is, in part, because we have been on a self -education journey with water for much of the past 10 years, reading many books, watching any movies/videos, listening first hand to exciting water stories. This web site seeks to share many of these books and movies/videos about water and its uniqueness. We challenge anyone, after watching most videos in our Cinema and reading all books in our recomended book list, to retain a blaise os staus quo attitude toward water. Some of the vidoes expressing experiences which support the theory that water has a memory can be seen HERE. How could anyone deny water of the capacity for a memory, after watching each of these videos??? Sure, if we decide to remain ignorant of such experiences, then we can maintain a status quo...but these experiences described in these videos are REAL. They have happened whether one is prepared to acknowledge them or not. Once having happened and been acknowledged by one human, they change the human knowledge library about water forever. Perhaps it is our children and grand children who will have the greater capacity to change, to learn more water truths; to explore our wider relationship with the wonders of water? Perhaps the water now in the bodies of most adult humans is as polluted as the outer water earth world...and if so perhaps the polluted 'water self', precludes rational and open mindedness and a keenness for change? Water, in its natural and healthy state, welcomes and enjoys change and lives with constant change. It is a flow. Can we also learn to 'go with the flow'? Has any one ever asked to use 'rescue remedy'? Does anyone really know exactly how the essence of flowers could be retained in water, when all physical properties are removed? To see the sensitive and near miraculous life of the medically trained Doctor Bach, see his story HERE. Today, after much time has passed, people all over the world still use his essences. Why would this be so if they do not work in some as yet unfathomable way? Then there is also the potential impact of homeopathic dosage/effects of any remaining (yet non observable by science) energetics of waters past journies. HERE is a video depicting one scientist (Dr Jacques Benveniste) who went on his own journey effectively thinking he would to disprove homeopathics, only to find to his amazement that his team of scientists were able to prove such on-going memory type relationship with water really can exist. One of the many great men and women who have studied properties of water akin to memory is Doctor Masaru Emoto. He died in 2014, but not without leaving us all a legacy of wonder, as we look at the pictures of crystals within water...and notice the range of emotions and feelings and memory the water presents, depending on its health, its source and surroundings, and the interaction between humans and such water. Doctor Emoto felt it was with children that most change of attitude toward water might come; and in this light he wrote a book for all children of the earth, saying he wanted it to be able to be distributed FREE to all children. Heartland Springs is tying to assist this goal within our web site --- as we offer a free download of Dr Emoto's children book HERE. If water truly has some form of memory, then those still drinking reconstituted sewerage in Auckland tap waters and in all products made from Auckland tap waters (no matter how much the water has been processed or filtered) then the imprint in the waters memory of its past journey (from body of another, to toilet, to sewer, to WAIKATO RIVER, to Auckland City reservoirs, to Auckland City taps) might still exist at time of drinking? This 'sewer memory' might be in addition to all the hormones and other endocrine disrupters that modern science simply does not know how to eliminate in the processing of sewerage and like contaminants. See Scientist Theo Colburn on video HERE about these endocrine dangers. Imagine the crystalline structure of water like this sewerage, being treated in the Waikato treatment plant. It is shown here pre-treatment, before it is later being discharged back into the Waikato River ... thence on a journey toward city water taps! To understand more about the memory of water---recall another of Dr Emoto's experiments. He placed a glass water container on top of a picture of dolphins. He then took the water from the same glass container and frooze some of this same water. Under a microscope he photographed this same waters crystalline structure ....AND he found the center of the water crystal embedded with pictures of dolphins! Imagine any scientist today trying to explain the logic and steps as to how this happened AND HAPPENS? The thought that one day our computers might rely on water for their memory (instead of the silicon from solid crystals) is another factor worth consideration. As one scientist in one of the 'memory videos' in our Cinema suggests----if water does indeed have a memory, then much of present day science and technical practice would need to be reevaluated. 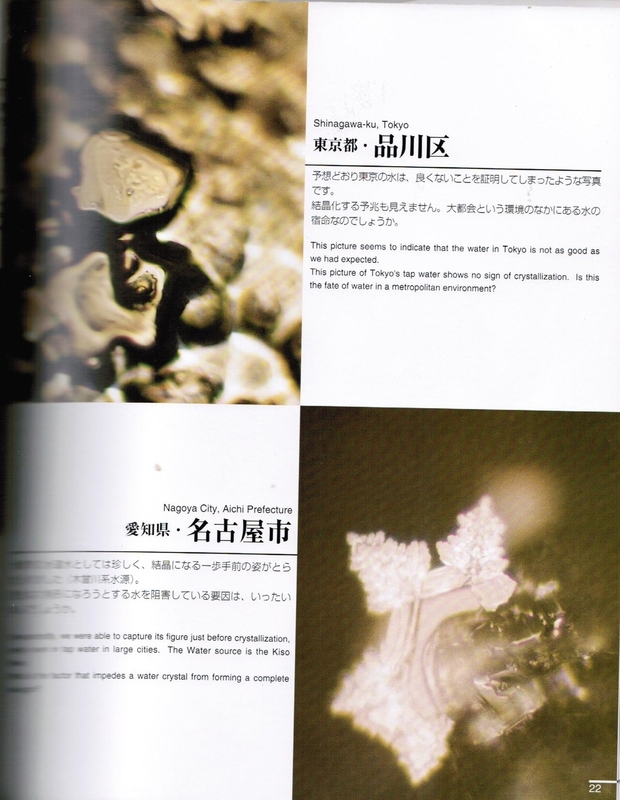 Here is copied a picture of Dr Emoto's picture of a crystal from some NZ groundwater, followed by another different Japanese spring water crystal from the spring called Sanbu-ichi Yusui. We dream about our Wai Challenge mobile classroom (see more details HERE) one day having therein a section where the viewing of such live water crystals can be seen by all children visiting such a mobile classroom. If someone reading this web page has funds and is prepared to fund the construction of such a mobile water classroom --- please do not hesitate to connect with us. Our children of NZ rely on a benefactor coming forward to add to our childrens' future education about WATER. “Water records information, and while circulating throughout the earth distributes information.